Green Ronin's AGE game system is one of the more innovative role playing systems on the market and the company has begun a major marketing push to promote the system. As a part of their promotional campaign, or as a bit of wonderful serendipity, the AGE system was selected by Wil Wheaton as the role playing system that would be featured in his entertaining TitansGrave: The Ashes of Valkana webseries. I've begun reviewing the show episode by episode, and will continue to do so, but one thing struck me as I was watching the second episode that prompted me to do a post that wanders down Probability Lane in the middle of Statisticsville. One of the things that really sets the AGE system apart from other systems is its "Stunt" system. 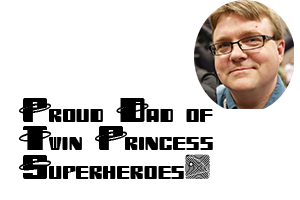 This system allows for an increase in player agency at key moments during a game session. It's a mechanic that evolved from early Greg Gorden designs like James Bond 007 which had pools of points players could spend that would allow their characters to do special actions that were out of the realm of possibility for normal "non-player" characters. Some early games that were inspired/influenced by this mechanic include Marvel Superheroes (Karma) and DC Heroes (Hero Points). This mechanic has been very influential in the story game genre where player agency takes priority over game master storytelling. Modern games in this school include, but are not limited to, D&D 5th Edition (Inspiration), Through the Breach: The Malifaux RPG (Twist Decks), and Savage Worlds (Bennies). While the "Stunt" system falls within this design school of modeling character heroics through the increase of player agency, the AGE take is relatively unique. Where most systems have a set pool of points, or have GMs give points to players, AGE allows probability to decide when players get points to spend. Additionally, and most importantly, many systems have either set effects like rerolls (Bennies) or allow for players to radically alter the elements of a scene (Hero Points and many story driven games). AGE takes a middle ground philosophically between these two extremes. 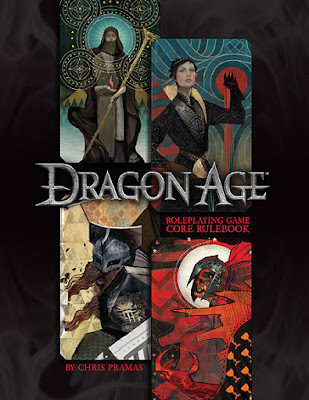 While stunt points allow for more than "mere" rerolls, the Dragon AGE role playing game provides lists of effects that can be achieved by spending stunt points and assigns each a cost. For example, attacking two foes simultaneously might require 4 stunt points while adding a die to damage might only require 2. These are only two, of a large number, of effects that can be achieved. What is important here is that while AGE allows for increased player agency, it does so within constraints that are balanced to ensure players feel challenged. So how does one acquire these extremely valuable stunt points? In any AGE game when a player attempts to accomplish a task, that player rolls 3d6 and adds whatever attribute is relevant to that task. For example, when picking a lock a character might add her Dexterity score to the roll. This number is then compared to a Difficulty Number. If the roll plus bonus equals or exceeds that number, the action is successful. If lower, then the action fails. One of these die is of a different color and in Dragon AGE is called the "dragon die", but we'll call it the "stunt die." How successful a character was with the action is sometimes (in the case of extended actions) determined by the value of the stunt die. If any two of the die come up doubles (or if all three come up as a triple), and the action is successful, the player acquires stunt points which may be spent to make that action special. Maybe the attack hit vulnerable spots or a lock is permanently disabled. These things are determined by the expenditure of stunt points and a player acquires a number of these equal to the stunt die value. Note that this only occurs when a player rolls doubles (or triples) and is successful. It's elegant and allows characters to feel extremely heroic in their actions, but this leaves open the question. How common are doubles on 3d6 and how do we even begin to think about these things. There are a couple of books that might be helpful. Chapter 3 of Reiner Knizia's classic Dice Games: Properly Explained is a good place to start, but I have found O'Reilly's Statistics in a Nutshell to be a wonderful resource to return to once the basic idea is understood. The first way we can see how frequently doubles, or triples, turn up is to write out all the possible combinations. In this case, it isn't too much work, but if more die had been rolled then it would have been far more time consuming and really we don't want to have to do this all the time. What we really need to understand is that this kind of problem is an example of an intersection of independent events. This means that it is an example where we are looking for matching results from things that are independent from on another. This is the case in all die rolls since what a die rolled on one roll does not effect what gets rolled on the next die roll. If you roll a six on a d6 and pick it up, you still have a 1 in 6 chance of rolling a six the next time you roll the die. These are independent events. Since this is a case of an intersection of independent events, we will use the following equation and modify it as a chance of not rolling doubles and then subtract that probability from 1. We know that the probability of rolling a number on 1d6 is 100%. The first number we roll doesn't matter, so that makes D1 = 1. We know that there are 5 ways to not roll the number rolled on the first die and that leaves us with D2 = 5/6. We know that the chance of not rolling a number on either of the first two die is 4/6 which makes D3 = 4/6. This leaves us with a 44.44% chance of rolling doubles or triples. 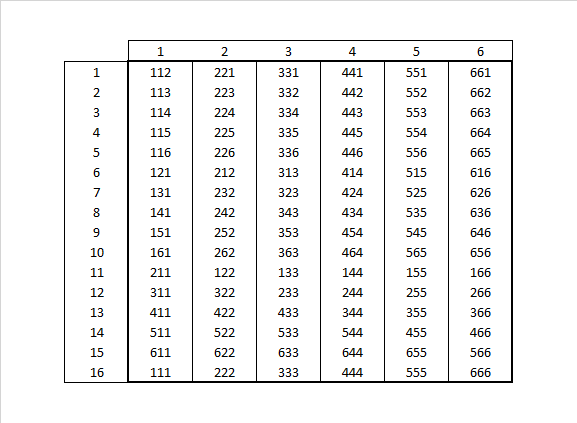 If you want to double check the equation, you can count the 16*6 combinations above and divide that by 216. 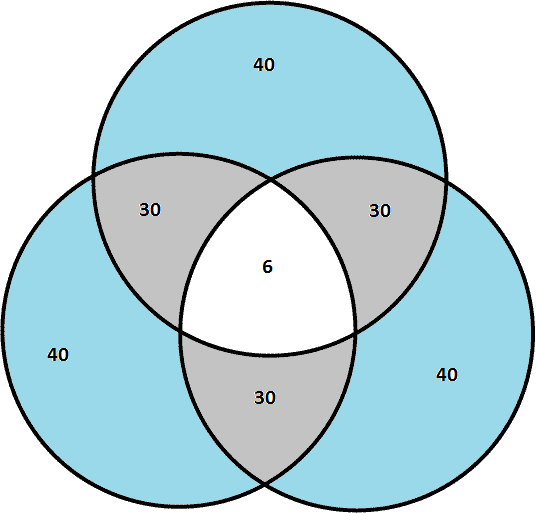 Another way of looking at this intersection is using this Venn diagram. As you can see, there are 6 ways of rolling triples and 30 doubles combinations at each intersection of any two dice (making a total of 96). As for calculating the odds of earning stunt points at any given Difficulty rating, that is beyond the scope of this conversation and I'd leave such analysis up for those much better versed in probability and statistics than I am.